Our week in Southern California was wrapping up and, honestly, I didn’t get to any of the restaurants I was hoping to. We were pretty confined to downtown L.A. on our trip and while we had a car, we just didn’t get time to go explore very much. I had never been to L.A. before and the only touristy thing we got to do was spend an hour walking the Hollywood Walk of Fame and looking at the hand prints at TCL Chinese Theatre. Saturday was our last day of actual work in Los Angeles. Sunday was a travel day so we had to button everything up. I had borrowed some equipment from a firm in Culver City that I needed to return before we really go in to our workday on Saturday. I had an 11:00 AM meeting set up with them that I didn’t need my co-worker for so I left him at the hotel to work while I went to the meeting. It was a quick, five-minute kind of thing where I just had to drop something off and thank them for their help while we were there. Before leaving I asked about places to eat. Without hesitation, they mentioned a nearby BBQ restaurant. BBQ? In Los Angeles? I was skeptical but when I looked it up, it had great reviews. I figured I should give it a try and BBQ sounded really good. 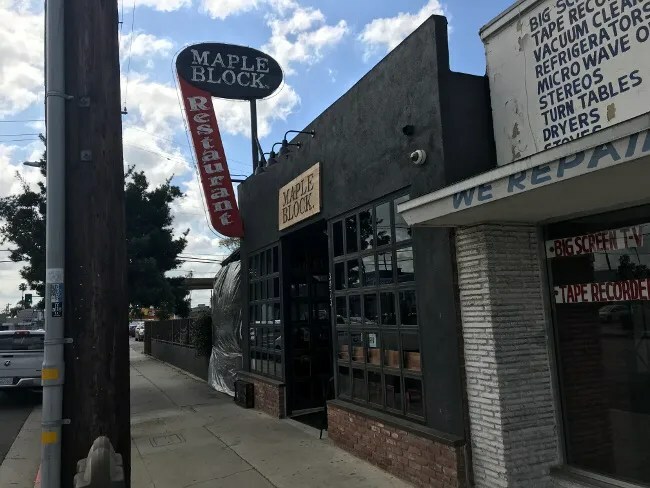 Maple Block Meat Company is on Sepulveda Boulevard north of Washington Place near The 405 in Culver City. 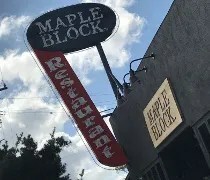 The building was an Italian place before Maple Block came in in 2015. There are options to order and to do call-in orders but I didn’t really know how far away I was so I just decided to wait until I got to the restaurant to order. The restaurant is an L.A. twist on a BBQ restaurant. There are no pigs on the wall and it doesn’t feel like a Texas Roadhouse. The decor is very sleek and modern in a rustic sort of way. 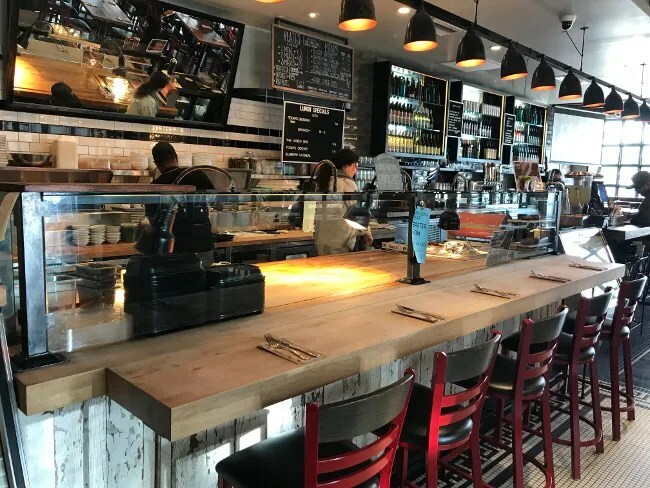 There is a bar just as you enter with counter service that transitions into the meat carving station where the smoked meats are cut in full view of everyone in the restaurant. There are two big dining rooms with table service. 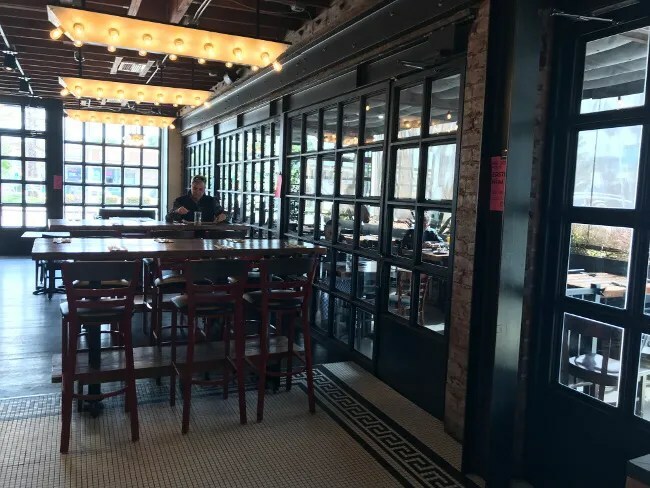 The first one is in this main area with pub tables along what looks like an old garage door area that has been filled in with windows. The second dining room almost looks added on. It features more of the smaller four and two tops. On Saturday and Sunday they have a brunch menu but the regular menus are still available as well. There is a carry-out order area near the far end of the bar that runs the length of the space. I told the hostess I just wanted to do carry-out. She handed me a brunch menu and pointed me towards the register. I had every intention of just ordering a brisket sandwich until I looked at brunch. There was an option for a brisket and egg sandwich. This thing sounded amazing so I ordered that and a medium side of mac & cheese. The meal set me back just under $20 which I paid for with a credit card. The wait was about ten minutes for my food to be bagged up and handed to me. I waited until I got back to my hotel in downtown Los Angeles before diving in. I started with the mac & cheese first. 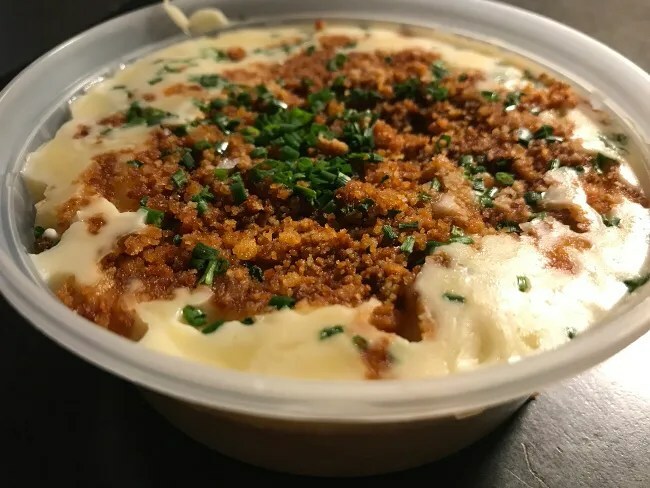 The creamy noodles were packed in to a small plastic container and topped with scallions and I believe some kind of bread crumbs…or maybe brown sugar. It was actually hard to tell but the crunch was a nice addition to a very creamy pasta dish. I had very low expectations for L.A. BBQ. When I was first told of the place, I wondered how they were going to ruin BBQ. Would there be pineapple or avocado on everything? Those fears proved to be unfounded. This is actually really good Texas BBQ. 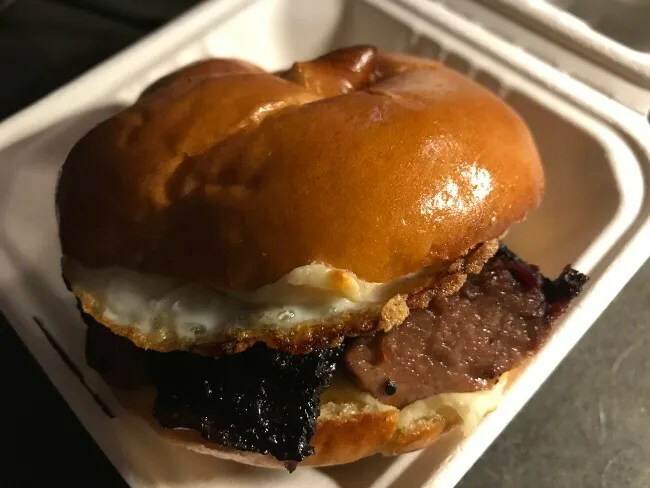 The Brisket & Egg Sandwich is super tender, juicy slow smoked brisket topped with a free-range fried egg and American cheese on a Challah roll. I could not get over how tender the brisket was. It was perfectly cooked and so delicious. The rest of the sandwich was like an added bonus. The egg was cooked so it was just slightly past runny and the roll was slightly toasted to add another dimension of flavor to this already incredible sandwich. I’ve eaten a lot of BBQ and I smoke my own all the time so I think I’m pretty knowledgeable when it comes to good BBQ. Maple Block Meat Company is good BBQ. I was surprised to find something like this in L.A. that is so true to the many different BBQ styles across the country. This is no “California BBQ.” This is good BBQ made the traditional way. They don’t try to reinvent the wheel..they improve on an already great design.